I could have sworn that I saw it said Chirping Chicken when I walked by, but now I'm not as sure. It definitely looks like their logo, doesn't it? Yeah it sort of does look like the Chirping Chicken. Hmmm...who knows? It is called The Chicken Shack and I assume it will be just like Chirping Chicken. 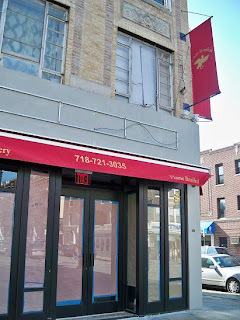 They bought the lease from the guys who owned Table 30 (also the same owners as Akti and Avenue as well as another greek place on Broadway and 29th).